Pets are welcome at this property. Please inquire for details. Only 20 miles north of Palm Beach International Airport (PBI), 60 Miles north of Ft. Lauderdale and 90 miles north of Miami. We will text you a map—easy to locate. At Headwaters Jupiter, guests reside in their own private retreat. 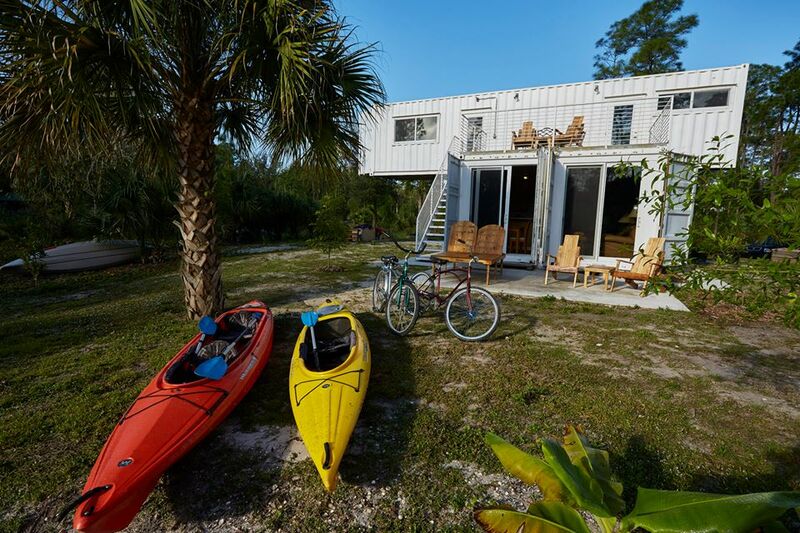 The main lodge is made up of three up-cycled shipping containers, and is surrounded by native Florida plantlife, edible gardens, and other thoughtfully designed landscape elements. The retreat sits with over 500 feet of frontage on the headwaters of the Wild and Scenic Loxahatchee River, across from a 1,000-acre wilderness preserve with five miles of bike and blueway trails. Come stay; come explore! Bikes, canoes and kayaks included. The entire retreat is all yours and can accommodate up to eight guests. There are four bikes, two canoes and four kayaks—ready to help you explore. There are two bedrooms upstairs with shared bathroom and balcony; downstairs there is one bedroom and bathroom with full kitchen, dining and seating area and an open wooden deck. There are four bikes, two canoes and four kayaks—ready to help you explore!